I received a phone call yesterday from Lisa at the local Chamber of commerce, being an avid birder she has keen eyes for these elusive critters. 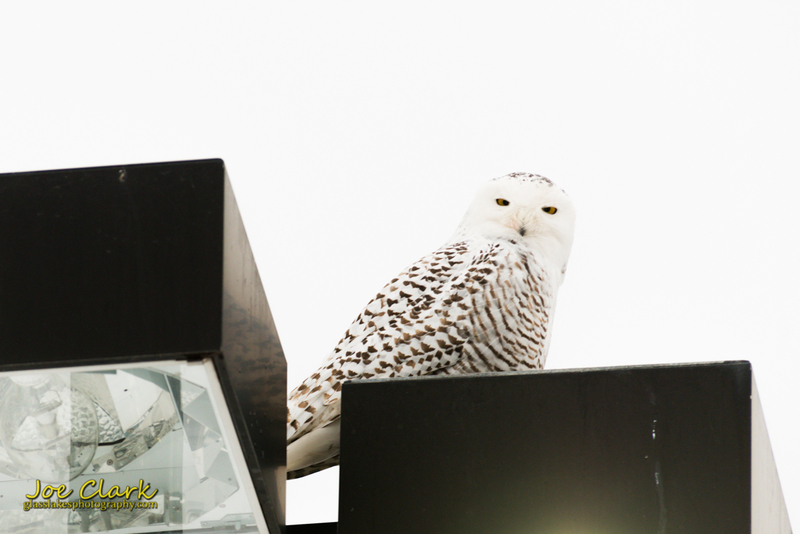 The hot tip was that a snow owl was perched atop a light post outside the local Office Max. Not that this particular perch is as aesthetic as I would hope, but I dropped my current project of putting a new seal on the oven and ran down there. After a few moments of scanning I noticed a larger bump on top of a post over at the edge of the parking lot. I parked as close as I dared, then ascended to the top of a large snow pile. This process ended up seemingly lodging half the snow bank into my boots. This bird didn’t seem to mind my presence as I was just another person navigating the commotion of the busy parking lot. I got a few shots then climbed down, and circled around to a position nearly underneath and within a hundred feet. The owl just sat there, looking at me. Perched upon an illuminated sodium lamp, likely enjoying the warmth. I got the owls attention by whistling, and was able to get this shot as it looked at me. If you look closely, the pupils are visible.